As someone who’s knocking on a bit (37 don’t you know, sonny) it’s nice to watch a band with momentum. It takes me back to bands I’ve been in moons ago: always planning the next gig, recording or art. These are amazing times to be in a band. Being in an organised band with tunes is the best. 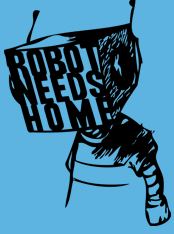 I love the Robot Needs Home logo, by the way.